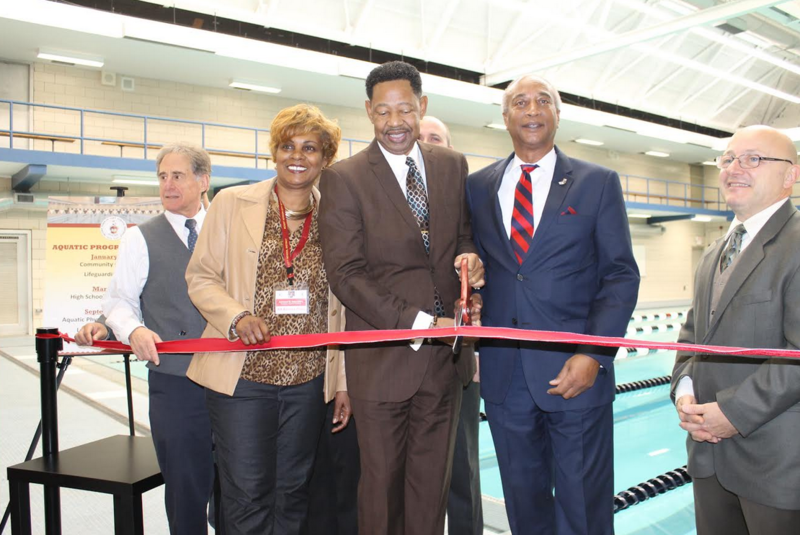 Superintendent Dr. Kenneth R. Hamilton, Assemblyman J. Gary Pretlow and members of the Mount Vernon City School District gathered for a ribbon cutting ceremony on Monday, December 4 at the newly renovated Mount Vernon High School swimming pool. In July 2015, Assemblyman Pretlow announced the allocation of $1 million in state funding to make necessary repairs to the pool. It was affected by a leak in 2010 and due to budget cuts, the District was not able to afford repairs. The capital secured by Pretlow allowed Mount Vernon to bring the pool into compliance with all applicable rules and regulations. Renovating the Mount Vernon High School pool was a priority for the District, but the funding secured by Pretlow accelerated the plan, which consisted of three phases and had an estimated completion date of December 1. In addition to student use, the District also plans to provide free year-round swimming lessons to Mount Vernon residents and offer training programs for students interested in serving as lifeguards. “The reopening of the pool is a significant event for the city of Mount Vernon and the school district because, according to a 2010 study commissioned by the United States Swimming and Research Corner, 70 percent of African American children and 60 percent of Hispanic children have very little to no swimming ability, compared to 40 percent of Caucasians, putting these communities at risk for drowning fatalities,” said Assemblyman Pretlow. During the first phase of the pool renovation project, electrical upgrades were made to support a new filtration system and the existing main drains within the pool, overhead pool lights, and pool cover system were removed and replaced with new, more efficient equipment. Additionally, a pool lane timer was installed to accommodate competitions. Phase 2 focused on the removal of all tiles from the pool’s floor and walls. The final phase of renovations included the installation of a new concrete shell in the shallow end of the pool to prevent future leaks, as well as a new floor slab. The entire pool area was reinforced with rebar, creating additional support and rigidity for the new floor. Additionally, tile was used to create break lines and lane markings, while marble-dust plaster was used for the remainder of the pool surface.